I first heard about this book around the time it won a Pulitizer in 2003, and remember thinking I would like to read it. Skip forward some years and I stumbled across a copy at the library with some excitement. Now I should explain that “somehow’ I was under the misguided assumption that this was some sort of sci-fi or futuristic novel where there is no longer male and female gender. I have absolutely no idea where I got this idea from, since the book is definitely not of that nature; though from reading other reviews of this novel, it appears others have assumed it was about seafaring or shipping (the cover picture) so at least I am not alone in my confusion. From pretty much the first page I realized that this novel wasn’t going to be anything along the lines I had assumed but soon found myself swept away on the story of Desdemona and Lefty. Having already established there was an incestuous relationship, I was intrigued to know how this would be handled and I quite enjoyed the exploration of the struggles of the couple having escaped death in Greece and their hopes in starting a new life in America. It was about halfway that I began to get a bit twitchy. This is supposed to be a novel about Cal – the grandchild of Desdemona and Lefty – a hermaphrodite who is raised as a girl but later lives his life as a man. Cal is there in the background for the first half/two-thirds of the book as an ominpresent narrator who, I have to say, can be a little intrusive. I can forgive the “risky” narration (where Cal tells of events he wasn’t alive to see ) but found some of the third person/first person shifts a little choppy. FINALLY towards the end of the novel we see the events that lead to the discovery of Cal’s condition – the exploration of the teenage years was really well done – very real in the insecurities and fears of that age about growing up, sexuality, finding oneself. This is about when I began to really enjoy the book and finished it quickly after getting to this point. 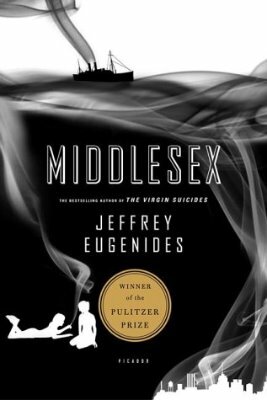 In essence this is an epic novel.It spans almost a century and covers events in Greece and Turkey, the struggles of immigrant families in the US, the depression, the history of Detroit, black activism, the Vietnam War etc etc but what I guess my main gripe with the book is that while Desdemona’s life is catalogued pretty much from childhood through to old age, Cal’s life from 17 to 41 is entirely missing ! I want to know why he never sought out the Object again, how he came to terms with his new body, and of course WHY HE CHOSE TO LIVE AS A MAN. I really feel like this was a weak point of this book- up to the point where there is medical intervention Calliope is a girl, exploring her feelings for other girls, but with a body that is slowly altering to that of a male. Then she writes a note to her parents saying she wants to be a boy and runs away! I would have liked to have seen some more emotional connect – some sort of revelation for Cal that would explain everything he had been feeling confused about and the ‘answer’ presenting itself (not an epiphany per se but more than just a decision seemingly out of the blue). I also thought the ending was weak and wish there was more about Cal and Julie and how a couple might overcome the issues and have a functioning relationship. I really struggled with some of the book and at times it felt a bit like a literary slog, however it has given me plenty to think about and though I wavered between 3 and 4 stars, I think there were moments of brilliance in the writing and some brave choices in subject and writing style so 4 stars it is. I read this around the time it came out, so it isn’t quite the freshest in my memory, but I remember having some issues with the narrator as well; I’m pretty accepting of intrusive/omniscient narrators, but generally I like there to be some sort of explanation provided as to the identity. That being said, I love Eugenides’ ability to create very distinct and memorable characters – Desdemona and Cal were so interesting. Question: what version of the list are you working from? I’m currently crawling my way through the most recent edition (2010), from which Middlesex was removed. We are working from the 2006 edition. Interesting to know that it has been removed from subsequent editions and would be good to know why and what for. I had the same issue with this book in regards to knowing why Cal finally settled on being male. My feeling was that the attraction to the friend and other women may have made more sense as a male rather than being as a female.